A Roseau man is to return to the Roseau High Court on Thursday March 6, 2014 for unlawfully and maliciously wounding another man of the city on the northern bank of the Roseau River nearly seven years ago. A jury found Steven 'Lele' Joseph guilty on a second count of wounding on Friday February 14, 2014 in a case of unlawfully and maliciously causing grievous bodily harm to Francis 'Preacher' St Rose on the Roseau River Bank east of the Riverside Apartments on Saturday May 19, 2007. Preacher told the court to the inquiries of State Attorney Sherma Dalrymple that he was on his way back to his home on the said Roseau River Bank where he saw some children throwing stones at a mango tree. He spoke to the children at about the same time Lele came from his home near the mango tree. Preacher said he had two stones in his hands. He asked the accused what he was going to do with the stones and that he could not lash the people's children. "I left him and walked away. All of a sudden he took a stone and struck at me and broke my leg. I fell next to a container. When I did pick up myself I was at the hospital, the Princess Margaret Hospital. I saw they were operating on me. They gave me a cast from my chest to my feet… I stayed at the hospital more than a week. The cast was on my right leg," Preacher said. While on the ground the accused threatened him with a cutlass. St Rose said he had the cast on for six months, but when it was removed his foot wasn't functioning properly. He had to go back to the hospital, open the leg and put in a piece of steel. Cross examined by Counsel Darius Jones, St Rose said he fell face down and lost a tooth when he fell on his face. Garth Jean Jacques who was about 15 years old at the time in 2007 was on a mango tree about 4:00pm with two brothers and two friends. Then he heard an argument. From his vantage point he recognised Steven Joseph and another man quarreling. "I heard the guy say he was going for his cutlass," he said. He saw Steven Joseph return with his cutlass and make an X with it in his yard. He went back. Then Francis turned his back and walked away. Garth said he next heard a bawling. He came down from the tree and saw Francis' leg bleeding. "We tried to lift him up we couldn't," he said. Corporal Brian Felix was on duty at the CID on Saturday May 19, 2007 when a report of grievous bodily harm was referred to him for investigation. He met and spoke with the complainant. On Monday July 28, 2008 was again on duty at the CID when he received certain information. He went on duty on River Street with other police officers and met the accused Steven Joseph. Joseph stated: "So long and now you coming?" The police took him into custody. The next day Felix questioned him. 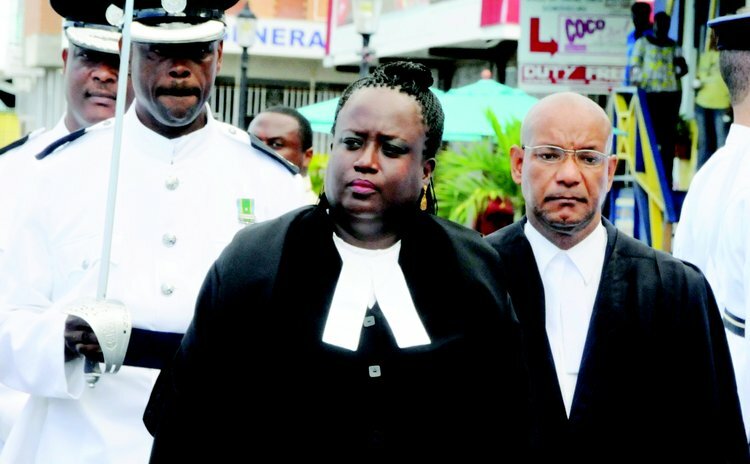 Corporal Felix had the accused and complainant confront each other on Wednesday July 30, 2008 following which they went to the scene of the wounding where both men had differing points of impact. Back at Police Headquarters, Felix charged Steven Joseph with grievous bodily harm for breaking Francis St Rose's leg. Steven Joseph, in his statement from the Prisoners' Box talked about Tallah coming to use his home for interference with a guy that would cost $20. Preacher came from nowhere and demanded half. "I told him to walk out off my yard. He started grumbling with me. I pushed him away from my yard. Then he grabbed on to a stone and striked at me. The stone tip me on my foot. And I picked up the same stone. I saw him going to pick up another stone. So I took the same stone and strike it back at him. That brought the confusion between the two of us," he said.